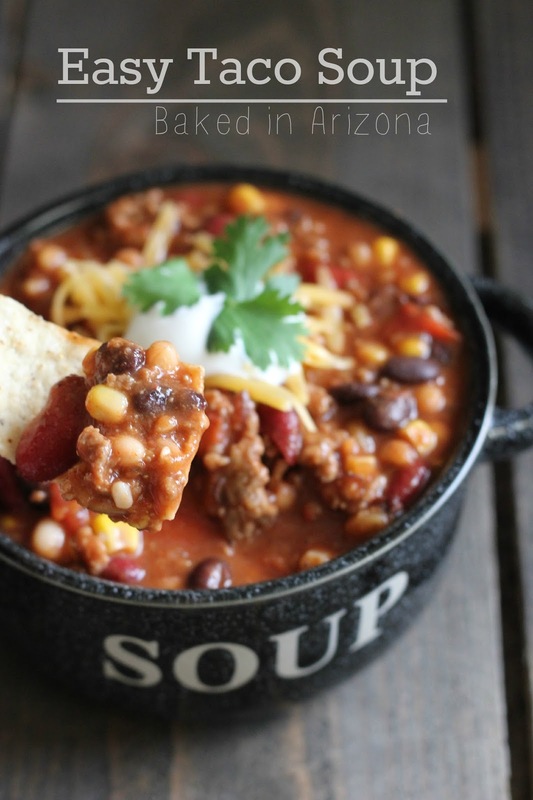 This taco soup is a hearty meal that is sure to become a family favorite! I remember when I first had this soup. I had gone up to Flagstaff to visit my brother and his wife. They had only been married for 6 months or so and I was coming to go snowboarding for the weekend. Jamie had a pot of this soup ready when I got there. You top it with cheese and eat with tortilla chips. I love this soup. It always brings back good memories too. Thanks Jamie for sharing this recipe with me! 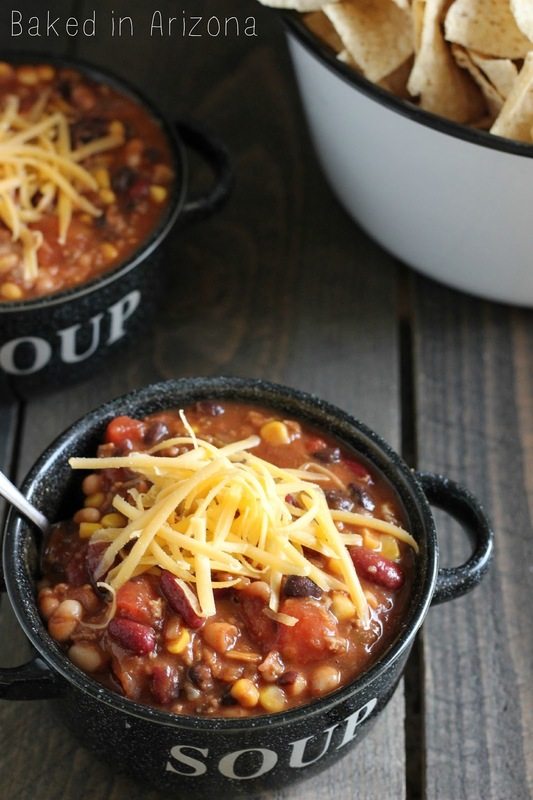 This soup is great because you can really use whatever beans you like or have on had. I altered the recipe by adding more tomato sauce and draining the corn and beans. We like it chunky and thick. But if you want it more soupy then you can add the corn and beans undrained. Make sure you eat it with tortilla chips. The scoop ones are the best if you have them. But really any kind will do. And don’t forget to put plenty of cheese on top! Some have asked me about my soup bowls. I got them in Utah while on vacation a few years back but found similar ones on Amazon. This can be made on the stove top or in a slow cooker. Either way, it will be a favorite comfort food. Brown the ground beef in a large pot. Drain the fat. Add the stewed tomatoes, tomato sauce, corn, beans and taco seasoning. Stir. You can cook in a crock-pot if you wish. Feel free to use any beans you like. 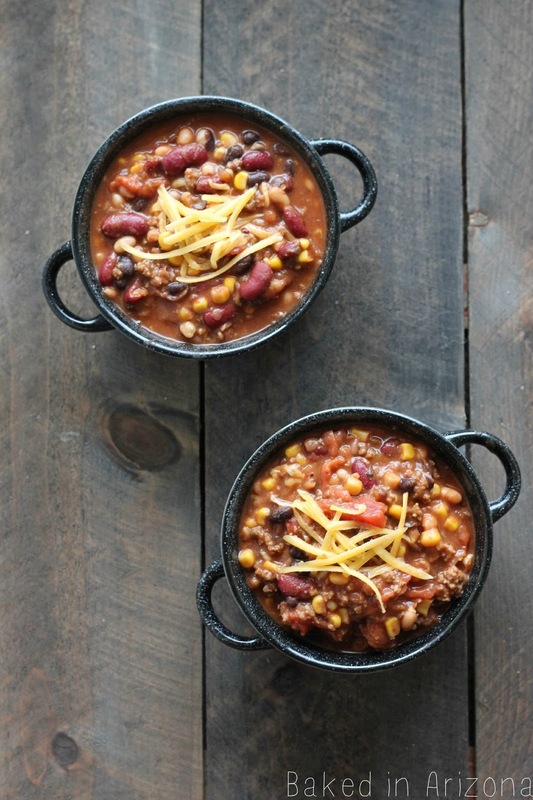 The original recipe used great northern, chili and pork n beans. If you don't like your soup thick, you can add the corn & beans undrained. If you can't find or don't have mexican stewed tomatoes, regular are ok to use. You can cut up the stewed tomatoes if you prefer smaller pieces. I have used diced and petite diced tomatoes when making this soup instead of stewed tomatoes and liked it as well. This recipe is very adaptable! You can also serve this with cornbread if you prefer (instead of tortilla chips). Recipe source: my sister-in-law Jamie. 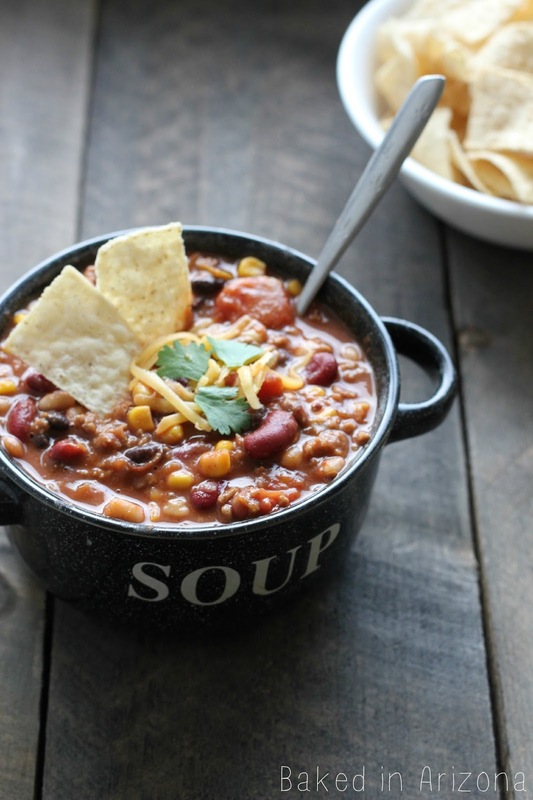 Check out these other soup recipes! Saw this today on the Linky party. I haven't made this soup in years, and just last week needed something quick and easy. Out came this recipe and I had forgotten how good it was. The only difference in the recipe I have is that it calls for a packet of Ranch dressing. I haven't blogged about it yet, but it's in the que. Nice to find your blog. Adding a ranch dressing packet sounds really good, I will have to try that! Thanks for stopping by! Leann is that ranch packet in addition to the taco seasoning packet or does it repace that? Oh wow, what a great new soup to try–and so easy! I found you at Spotlight Saturday party. Thanks for stopping by! It is such an easy dinner and delicious too. Hope you enjoy it! Where did you get those cute soup dishes?! i love them! This recipe is awesome too! So happy to have an easy but delicious meal to make today! Yay! Me too! Easy and delicious are my 2 favorite things when it comes to dinner!